Recently I have faced a problem with my Outlook. While starting Outlook, it prompts me with a message that it will not open my Outlook.pst and shows errors. When I click OK it closes Outlook. Now I am in a mess. I want to get back all of my emails back. For safety measures I have used Windows Backup to regularly backup my Outlook.pst file. Now, when I am trying to restore my backup it also gave me missing catalog error. Can you guide me how to go about recovering pst files from backup or repair my Outlook emails to get back my emails. Yes, surely we can help you in recovering your emails. You can recover your emails by using either of the 2 ways. Now, when the NTBackup restore utility is showing catalogue error, in such situation you can recover your PST file by taking assistance of BKF Repair Utility. The utility is deployed as it holds the potential to restore a backup file even from its highly corrupted state. 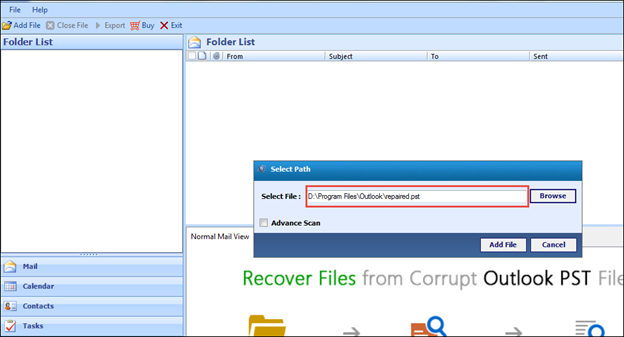 Read and follow below steps to learn how to extract Outlook .pst file form corrupt .bkf file. Read and follow below steps to learn how to extract outlook.pst file from corrupt .bkf file. Run the utility and click on browse option to locate the corrupted BKF file. 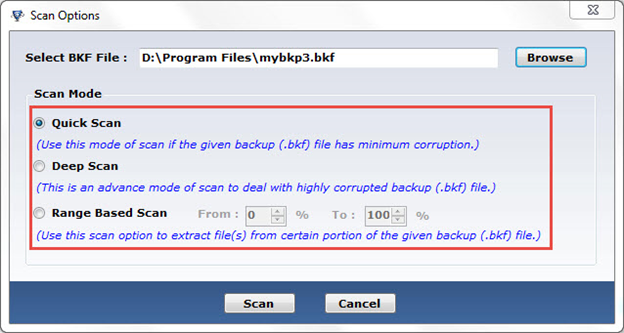 Click on Quick Scan to scan the BKF file if it is not highly corrupted. In case the corruption is high go for Deep Scan.Note: Range Based Scan should not be selected as we are not aware of the precise portion in which our corrupted PST file resides. Once scanned, select your PST file that you want to recover. Extract the PST file to the original or to a different location. 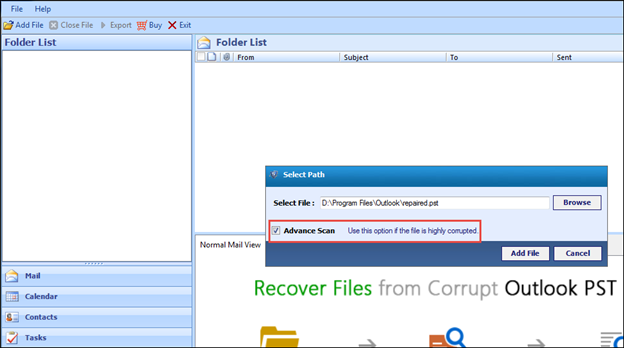 You can also recover the mails from corrupted PST file by deploying an inbuilt Inbox Repair tool- Scanpst.exe. This utility is a part of MS Outlook portfolio and gets installed in the user’s system at the time of Outlook installation. 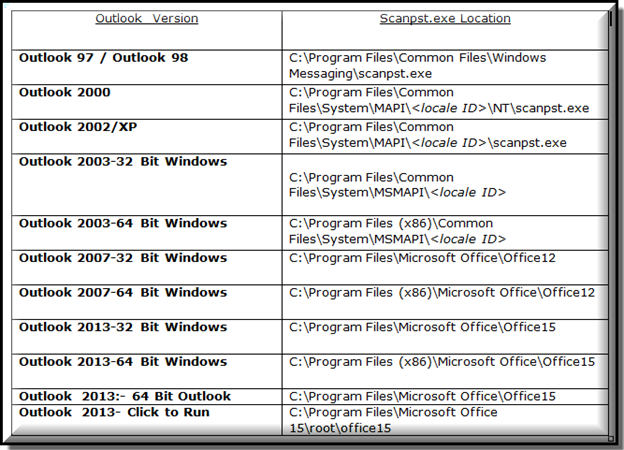 The location of this utility varies with the Outlook version that is installed in the user machine. It repairs the corrupted PST file and turns it into a healthy PST file. But in case your PST file is highly corrupted, scanpst.exe will not turn out to be helpful. Also this utility increases the chance of data loss due to the fact that during PST repair it deletes all the tables in the PST file that are corrupted. Note: It is advised to create a backup copy of the corrupted PST file before starting to repair the corrupted PST file with the Inbox Repair Tool. 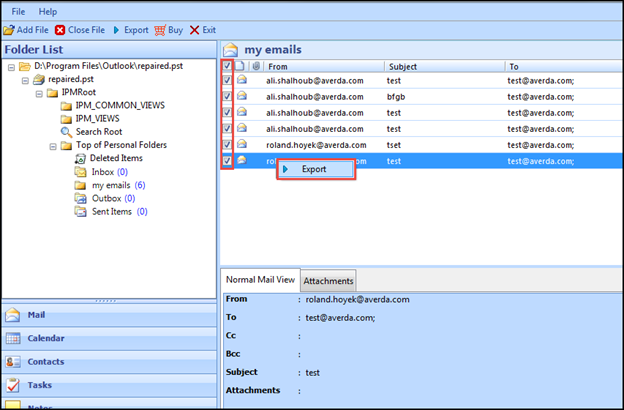 Add the PST file from which you want to recover your mails. Since your PST file is highly corrupted, select Advance Scan option. 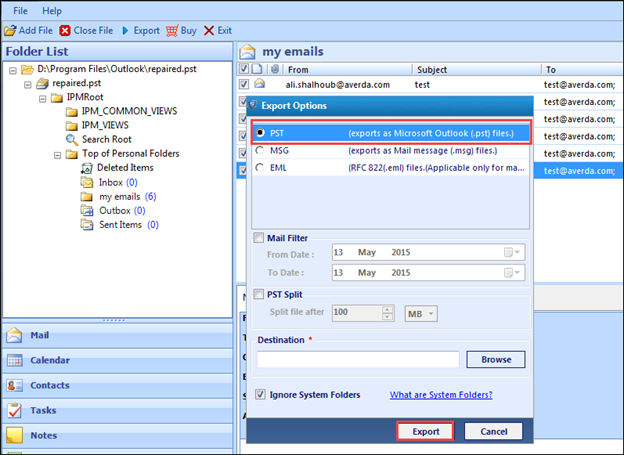 Select all the mails that you want to recover and select Export option. Select PST option to save the data recovered from the corrupted PST file in a new healthy PST file. The software will create a new healthy PST file after recovering data from the corrupted PST file. This new PST file can be easily imported in MS Outlook (http://www.systoolsgroup.com/outlook-recovery.html) to work with its data in the future. Copyright © 2015-2018 FREE PST Viewer. All Rights are Reserved.